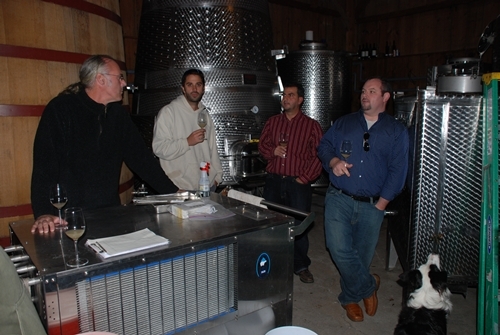 Our first visit to Roanoke Vineyards on the North Fork of Long Island was during Taste Camp 2009 last May when we tasted with owner/vineyard manager Richard Pisacano. (on the first visit post there is a video of Richard giving a good history of Roanoke) We had a fantastic time and used our visit to Long Island in October to revisit them and taste through the rest of their portfolio. We met up with Adam Ehmer aka @oldgrimy and he tasted us through about 7 wines including a few unreleased wines, in decanters labeled with masking tape. The experience was also paired with a nice cheeseboard and baguette. I don’t remember what cheeses they were, but the complimented the wines nicely – and helped keep the palate from getting fatigued. 2008 Rose (cab sauv, cab franc, merlot, 25% Chardonnay): lot of strawberry and watermelon on the nose with similar palate including hints of fresh hay and raspberry. Full body and crisp. 2008 Chardonnay (84% in stainless, 16% oak aged blended in): very tropical in nature, very fruity almost “sweet”. Bit of citrus in the mid-palate with hay and mineral notes leading to a clean finish. 2007 Marco Tulio (50% Cab Sauv, 50% Cab Franc, splash of Merlot – 12 months in oak): bright fruit leading off with black currant and boysenberry both on the nose and palate. Great layers of tobacco, leather and hazelnut with interesting touch of lavender towards the finish. Full bodied with rich leathery tannins. 2006 Gabby’s Cabernet Franc (92% cab franc, 8% merlot – 20 months in 50% new French oak): dark ripe fruit flavors, blackberry, black currant and baking spices dominating the nose. Similar fruit on the palate, but more red fruit coming through predominately raspberry with notes of cooked greens. Full body. 2006 “Blend One” (80% Cab Sauv, didn’t write down the rest of the blend): black fruit and earthiness on the nose. Leather, blackberry, mocha and coffee bean on the palate with an crazy note of mint chutney at the finish. Lovely flavor profile but felt a bit light/thin in the mid – palate. 2006 Cabernet Sauvignon (88% Cab Sauv, 9% Cab Franc, 3% Merlot): the aromatics greet you with black cherry, and boysenberry with dark chocolate interlaced. Full bodied palate with blackberry, eucalyptus and cardamom. Still young – think it will drink better down the road – huge tannins. 2007 Cabernet Franc (94% cab franc, 6% merlot): old world style, with red cherry, red currant and hints of earthy barnyard notes on the nose. More red currant on the palate with bing cherry, red clay and spice box flavors continuing through the finish. Still a baby (wasn’t released at time of sample) with huge tannins and great acid backbone – age worthy Cabernet Franc. 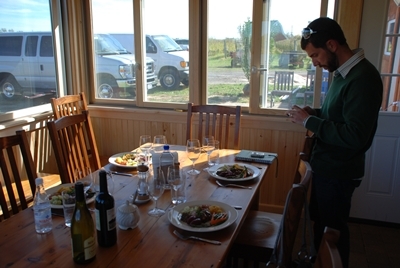 After tasting, Adam poured us a glass of our choice (cab franc for me) and took us on a tour of the vineyard. Sampling a few grapes here and there we walked up and down the vines, dodging the always startling blast from the bird deterring air cannons. 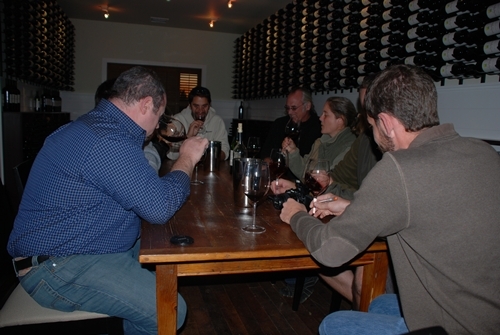 It was the last tasting of our 2nd day in Long Island and a great finish to the day to say the least. I hope to get some of the ’07 Cabernet Franc before it runs out now that it is released but I did bring home some of my other favorites including the Gabby’s Cab Franc and the Marco Tulio. Both are resting nicely down in the cellar – I’ll try to hold on to them as long as possible, it’ll will be fun to see these guys age. 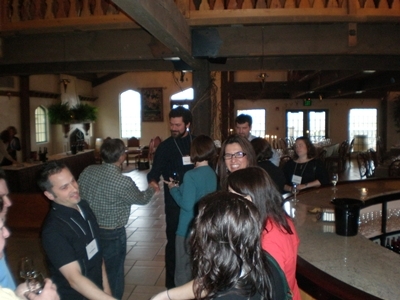 My first tasting of a Roanoke wine was at the first Wine Bloggers Conference (WBC) in October ’08 at an after hours tasting of New York wines provided by Lenn Thompson of The New York Cork Report. After meeting Adam he let me know that I was quoted on their release flyer for the ’06 Cabernet Franc, the wine that I had tasted at the WBC. Having only had one or two unmemorable New York wines (before) I was excited to get the opportunity to taste a good sampling from the state. Being from Virginia where Cabernet Franc does extremely well I was most eager to see how New York compared. I have to say that I was impressed with the unhampered expression of the varietal. 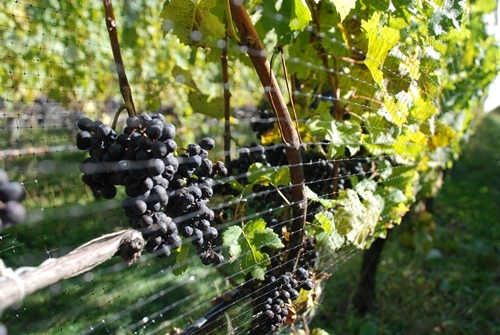 (The winemakers) aren’t trying to make a Cabernet Sauvignon from Cabernet Franc. 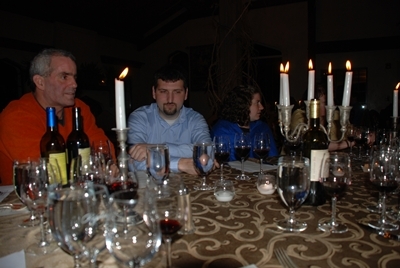 The one that stuck out in my radar the most was 2006 Roanoke Vineyards Cabernet Franc from Long Island. Nice bright red fruit aromas on the nose laced with a touch of wet earth followed by raspberry-cherry and the tell tale raw green pepper flavors. 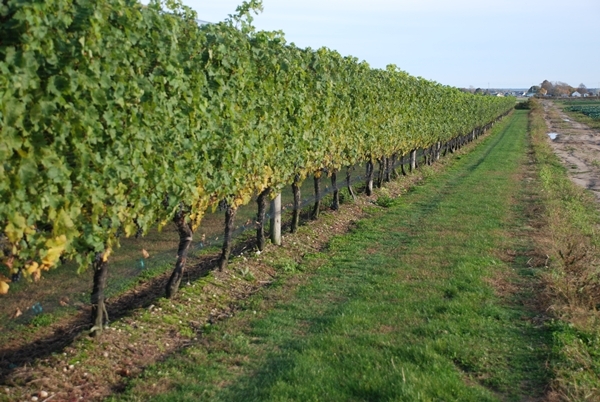 As you can tell, I’ve been a fan of their wines since my first tasting and couple that with a first class tasting room experience, I will definitely return the next time I am in Long Island. Thanks to Adam for the great time – hope to visit again soon. During our recent visit to the North Fork of Long Island, we had the pleasure of staying at the Shinn Vineyards Farmhouse B&B. Following a fabulous lunch at Shinn during Taste Camp back in May, Megan and I agreed that we MUST come back and stay at Shinn—six months later, here we were! 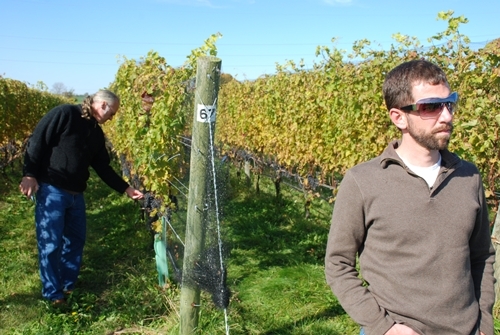 We visited Shinn during harvest, so it was a lot of fun to see (and taste) all the action while we were there. Each morning we took a long jog along their country road lined with vines, while tractors and field hands (and birds and bees) buzzed back and forth between vineyards. Then we returned to the house to enjoy a cup of hot coffee while wandering lazily through Shinn’s vineyards, snacking on nearly ripe grapes. We also spent the mornings watching grapes get sorted and crushed on the crush pad, tasting fresh juice, chatting with their winemaker Anthony Nappa, and generally getting in the way. Once we had worked up on appetite, we had the pleasure of an amazing breakfast prepared by owner David Page, a former professional chef. We had everything from homemade fruit smoothies to leek and mushroom risotto topped with a fried duck egg. Needless to say, these scrumptious breakfasts got our wine tasting days started on the right foot. 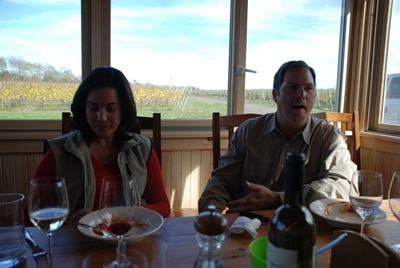 Our tasting at Shinn began in the vineyard with owners Barbara and David. During the walk we learned more about their growing techniques while we sampled Cab Franc and Merlot grapes fresh from the vine. 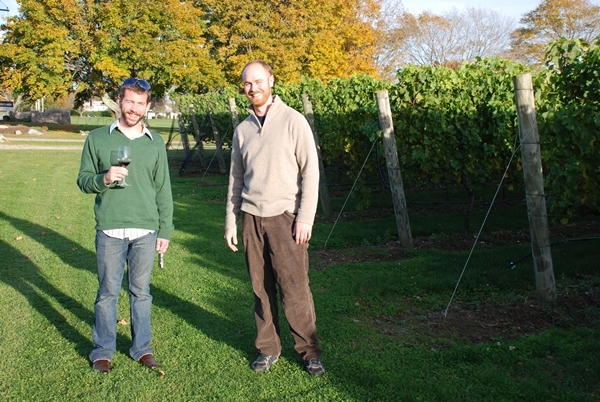 When fellow bloggers Lenn Thompson and Michael Gorton Jr. arrived, we headed into the winery with David and Anthony to sample their current works in progress. 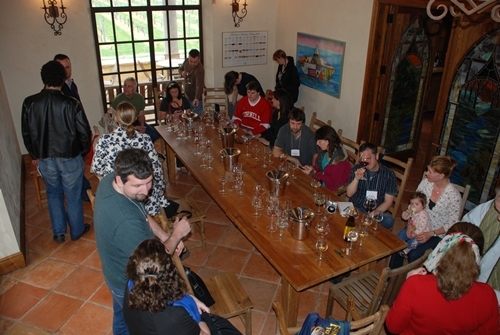 We tasted some of the ’09 juice that had already come in, including the Chardonnay, Sauvignon Blanc and Pinot Blanc. I was most impressed with the Pinot Blanc, which was produced as a wild ferment. It was wonderfully crisp, beautiful citrus with touches of petrol – very reminiscent of an Alsatian style. 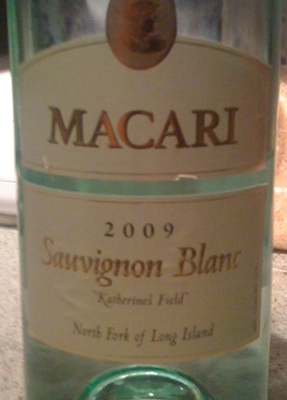 07 Sauvignon Blanc/Semillion – lots of white tea, fully body and tropical fruit, with the addition of a nice briney, mineral quality. 04 Cabernet Franc – raspberry reduction on the nose with lots of cedar and spice, slight floral note on the palate with raspberry, green bean, cassis and a hint of brett(??). Very well integrated tannins and acid – beautiful. 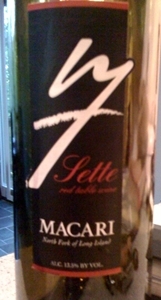 07 Malbec – roasted chestnut, cocoa, black fruit with fairly racy acidity. Full bodied, young and vibrant. David was also nice enough to pull out a 95 Cabernet Sauvignon from Bedell Cellars – barnyard and earth, leather, dark fruit and cedar. Ripe plum and blackberry. Still very big tannins and “spicy” acidity. 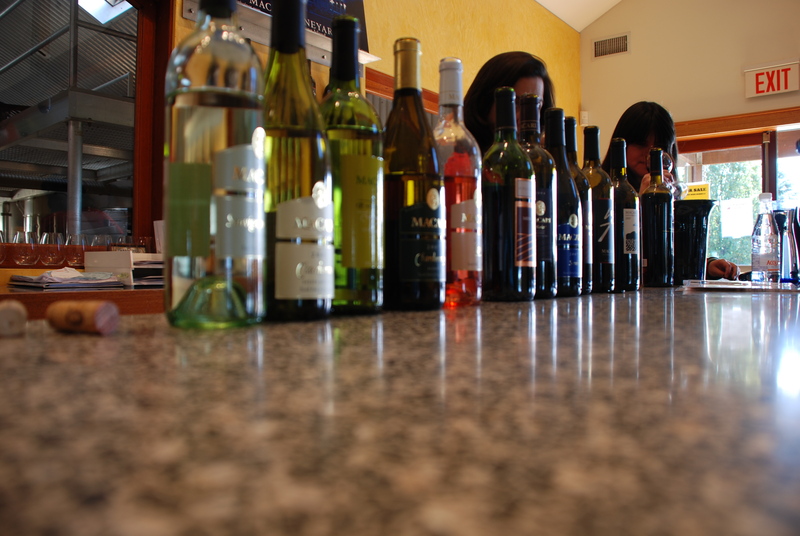 Over the next couple of days we sampled Shinn’s regular tasting room lineup — I will give you a tour of those wines in a future post. Thanks to David, Barbara and Anthony for showing us a great time. A Sparkling House in Long Island? 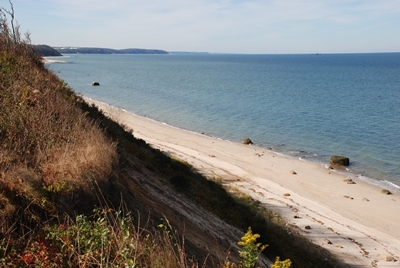 Yes it’s true there is a sparkling house on the North Fork of Long Island. Not that making sparkling on the North Fork is odd, there are actually a lot of good Method Champenoise sparklers being made on the island. The fact that they employ a sparkling only model is the odd/brave part. We visited Sparkling Pointe about 4 hours after they opened there doors this past Sunday and were greeted by a sparkling white facility complete with a VIP room with bubble chandeliers and an elevator (it was required for code). The idea of a sparkling only winery isn’t new, many reside in California (Gloria Ferrer, Domaine Chandon) it is just a new concept for the East coast. We met with owners Tom and Cynthia Rosicki as they gave us the grand tour or their new facility, and tasted us on their wines. Wine maker Gilles Martin makes three different sparklers, a Brut, a Rose (Topaz Imperial), and Brut Seduction (an aged cuvee). 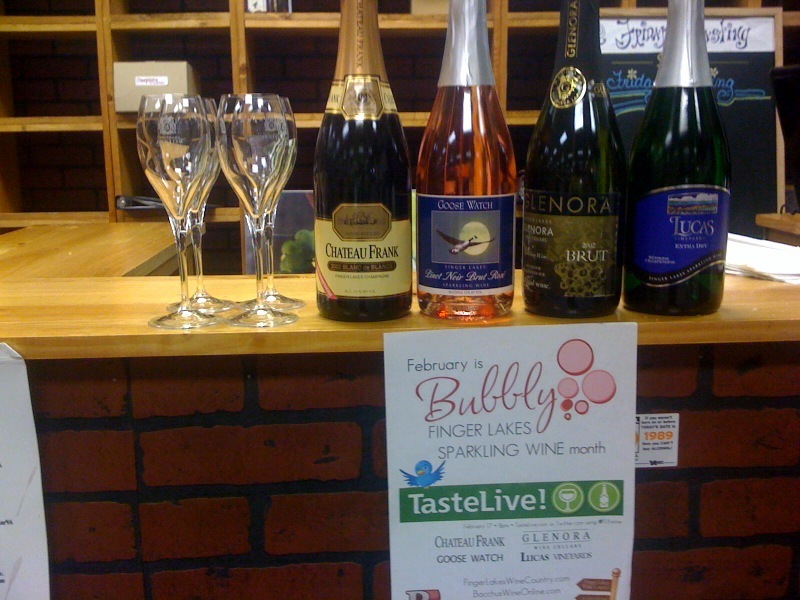 2005 Brut ($29) – baking biscuits, apple pie, sweet toast, and hazelnut. Full body, nice tight bubbles. 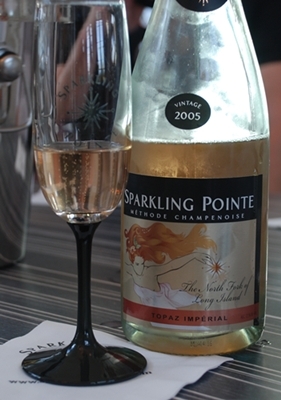 2005 Topaz Imperial ($33) (52% Chardonnay/48% Chardonnay) – black cherry, toast, dough, very tight bubbles. Full body with hints of strawberry and watermelon. 2000 Brut Selection ($50) – slight hints of wax on the nose with beautiful apple and pear, hints of summer hay, and toasted almonds. Creamy mid-palate, and extremely long finish. I was super impressed with the selections but Sparkling Pointe doesn’t need my accolades as they have won many of their own. The beautiful setting and the wonderful bubbly are a great addition to the North Fork wine community, I wish Tom and Cynthia all the best in their sparkling endeavor.